Coed Dinefwr design, manufacture and install a wide range of outdoor timber products including farm and drive gates, picnic tables, benches, foot and cycle bridges and boardwalks. 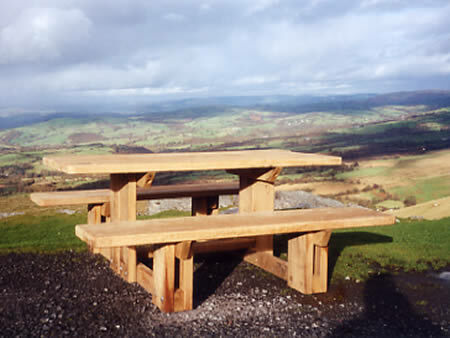 Coed Dinefwr designs and manufactures a range of timber benches and picnic tables. The products are competitively priced and are supplied widely, to local authorities, national contractors and private individuals. Benches and picnic tables are designed with an emphasis on durability and comfort and are entirely made from sustainably sourced British timber. We can adapt our seating to customers individual requirements. 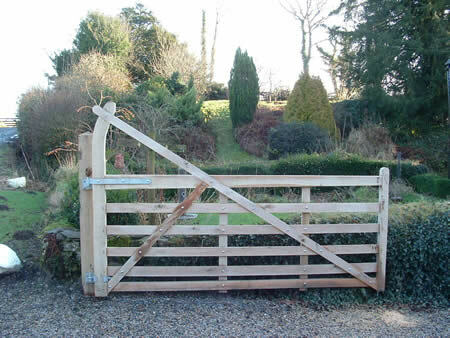 Our range of gates and doors combine simplicity of design with strength and durability. We manufacture farm, entrance and close-boarded gates and doors in tanalised native softwoods (Douglas fir or Larch) and in British unseasoned or ‘green’ oak. This is supplied in its natural colour and can be left to weather or be treated. Our outside doors combine strength with security features and can be tailored specifically to your requirements. 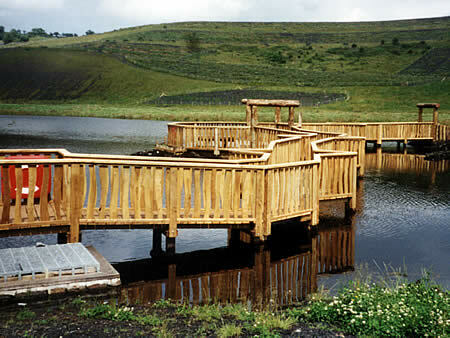 Coed Dinefwr produces flexibly designed, sturdy footbridges with spans ranging from 1 to 12 metres. 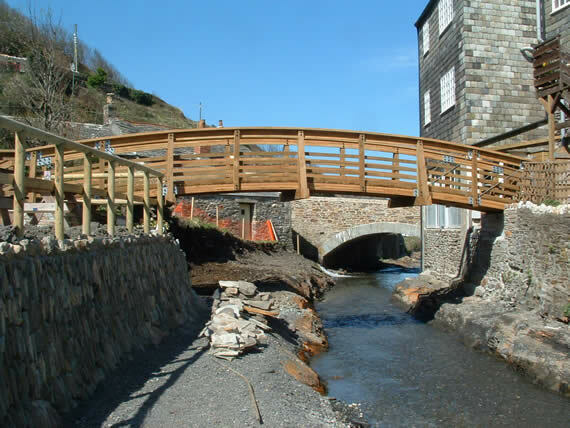 Bridges can be made from softwood or oak and feature non-slip decking for safety. We offer a design and manufacturing service for laminated beams for strength and economy. Bridges can be installed by our skilled workforce or can be supplied in kit form for self-assembly. We make boardwalks and decking for a wide range of situations and we offer a variety of designs suitable for each individual area. We have built up installation expertise in some challenging environments including woodland, hillsides and in or adjacent to water. Boardwalks are made from green oak or tanalised Douglas Fir and feature non-slip decking for maximum safety. Everything is made from sustainably sourced British wood, either 'green', unseasoned oak or tanalised Douglas Fir and Larch. We offer a sawmilling service so products can be tailored exactly to customers' requirements. With all our constructions the emphasis is on strength and durability combined with simple, elegant design. We also supply cladding and decking for domestic and commercial use as well as machining timber for special projects.